Have used these several times and I am favorably impressed. Very comfortable wearing glasses with the gel pads. The sounds are so natural in quality and volume that I sometimes forget that I have them on. Great for range time. I can hear commands but the gun fire is suppressed instantly and very tolerable. 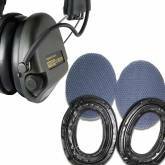 Best sound suppressing muffs that I’ve used. Очень удобные, хорошее качество звука, качественно сделаны, защита от дождя. Наушники не из дешевых, но они того стоят. I have used may different brands of electronic hearing protectors over the years and these are simply the best I have ever encountered. Quick order processing and deliver from DAA (as always!). Excelente producto, súper cómodo y práctico y de muy buena calidad, totalmente recomendable. 2. The Pro-X comes backed with a Manufacture's 5 year full warranty (the supreme pro has one year full warranty). Rugged "military spec" construction: One piece molded cups, steel pins connecting the head band, glass fiber reinforced polymer head band and water proof one-piece switch rubber control panel.